Castle Hills is a vibrant city with beautiful homes set on oak studded acreage lots. This quaint city offers homeowners a more laid back lifestyle with access to quality dining and casual bars. There are many quaint shops and small businesses as well as a couple of banks. There are several great schools and churches located inside the city. Castle Hills also has its own City Hall, Fire and Police Departments. Castle Hills is ranked #77 in the state of Texas and $658 in the U.S. Castle Hills livability score rates better than Texas (73) or the U.S. as a whole (72). Population is moderate while more than half the community is married. Castle Hills is a great location and among the more desirable suburban areas around San Antonio with residents willing to pay a higher price to live there. Being in such a prime location, everything is nearby. From great shopping at North Star Mall or La Cantera to a day at San Antonio’s premier 311-acre green space Phil Hardberger Park. Its free to all, and features dog parks, playgrounds, and an Ecology Center. There are regular events held at the park and there are also many trails for hikers, bikers and runners to explore. 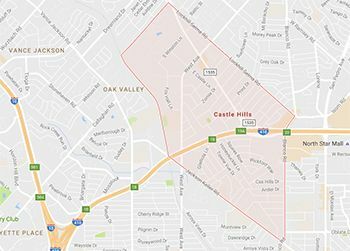 Here are some local stats we were able to find about living in Castle Hills, TX as published by areavibes.com. There are several newer neighborhoods located inside of Castle Hills. Check out our results displayed below.